1541-42 The Coronado expedition travels across the southern Great Plains. Sometimes all who wander are indeed lost—or being deliberately misled. 1598 Spanish colonists led by Juan de Oñate colonize the Rio Grande valley in what is now the state of New Mexico. c. 1656 A group of Indians from the Taos, N.M., area flee the Spanish and their missionaries and travel about 300 miles northeast to an "oasis" on the Great Plains, a small valley watered by a tributary of the Smokey Hill River in what is now western Kansas.This is all in the pre-horse days, which means they walked. What did they eat? What information did they have about where to go? 1680 In a rare example of cross-tribal cooperation, inhabitants of various New Mexican Indian pueblos launch a coordinated attack on Spanish colonists (particularly the priests), killing some, destroying mission churches, and chasing the remaining Spanish south into old Mexico. 1692-96 New Spanish soldiers and colonists led by Diego de Vargas complete the so-called "bloodless" reconquest of New Mexico, which actually involved some hard fighting against die-hard Indian warriors. 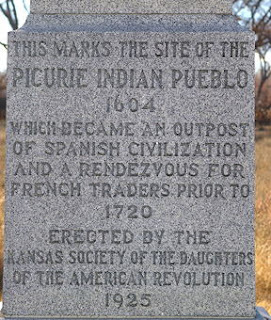 1697 The Pueblo Indians at El Cuartelejo are "brought home," maybe? A definition: The Spanish referred to the southern Great Plains as El Cuartelejo–The Far Quarter of their empire, at least on paper. The name is also applied to this particular small Indian pueblo. In its plural form, the name also referred to some of the Plains Apache people who lived there until the early 18th century. A 1925 historic market gives a date for the pueblo that is probably too early. All this is background. 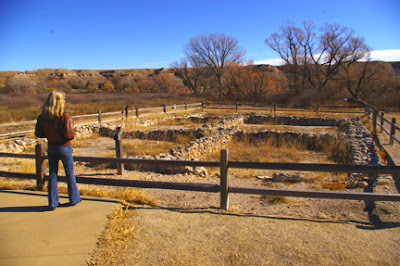 Some time ago, I heard of ruins of an Indian pueblo in western Kansas. Since we usually associate rectangular, stone-and/or-adobe buildings with the Southwest—New Mexico and Arizona—this was certainly an "outlier" in several senses. Last Saturday I visited it, part of Scott State Park: How strange to see such a foundation in this land of cattle ranches, center-pivot irrigation, and gigantic farm machinery. There is a historical marker out on US 83 for those travelers in a hurry. There were two naturalists ... actually, they were paleontologists from the University of Kansas—Williston and Martin And they excavated and found the remains of a small, seven-room pueblo ... just the foundations, with the floor literally covered with burned corn and artifacts. They had the pueblo, and then they discovered three major irrigation ditches. These run off of the springs that were there at that time. [Witty describes] this rancheria as a large village complex, in which the Taos Indians built their pueblo structure and practiced horticulture in nearby garden plots, while the Apaches with whom they were associated roamed farther afield. Tu-pa-tu, one of the principal leaders in the revolt, was a native of Picuris, and after the slaughter of all resident Spaniards, led the warriors of the pueblo to Santa Fé to take part in the siege of Otermin. The Indians not only massacred the priest, whose name was Mafias Rendon, and burned the church and surrounding buildings, but they killed every individual Spaniard living in the valleys of the vicinity. There is no record of the escape of even one to tell the tale. When the reconquest took place, quite a fraction of the population, not reconciled to renewed subjection to the Spaniards, emigrated to Cuartelejo, on the plains of western Kansas, but they gradually returned when matters became settled and their fears had subsided. Visiting the site on a chilly, windy November day, I can attest that the small valley (or large arroyo, depending on your perspective) protects you from the gentle prairie breezes. But it must have been tough there on really severe-weather days, huddling over a fire of buffalo chips. For the moment, however, we must note the activities of Governor de Vargas, whose reconquest of New Mexico compelled him to engage in the fall of 1696 in an expedition to the east. In that year some Pueblos, obstinately refusing to accept the Spanish king and God, rebelled and fled from their homes eastward over the Taos Mountains. De Vargas, setting out at once from the Picuries Pueblo recaptured, after an exciting chase, the majority of the rebels but the rest escaped in company of some Apaches. The general’s Journal of the event does not give sufficient information to state how far he penetrated on this march. He later stated he traveled eighty-four leagues; but whether this is the distance for one or both ways is not clear. His entire journey, going and coming, however, consumed only seventeen days, two of which were spent in camp because of a blinding snowstorm. Colonel Twitchell, nevertheless, has interpreted his remark and the diary to mean that the journey took de Vargas eastward beyond Clayton, New Mexico, into the western Panhandle of present Oklahoma. In the following year, 1697, the Reconquest of New Mexico was completed but the re-occupation of the lost province still presented serious problems to the Spaniards. Constantly on the qui vive against a new uprising, they were quick both to investigate suspicious rumors of revolt and to lend helpful hands to the Pueblo Indians. In this latter spirit the governor despatched in 1706 an expedition to the far off Cuartelejos to bring back the fugitives who escaped De Vargas in 1696, and others there enslaved, and who now sought the privilege of returning to their kinsmen. The expedition, commanded by Captain Juan de Uribarri, journeyed through the Jicarilla country of Northeastern New Mexico, the Carlana country south of the Arkansas and then eastward from near present day Pueblo, Colorado, to the Cuartelejos in Eastern Colorado of to-day. These savages received the expedition with genuine expressions of friendship, offered no objection to the loss of their slaves and servants but loaded the Pueblo ponies high with corn and sent off Spaniards and Indians rejoicing. By the 1730s raids by Comanche, Ute, and Pawnee had decimated the Cuartelejo Apache. The survivors moved south to join the Jicarilla Apache at Pecos. However, after 1763 and the French retreat from the area, the pueblo was abandoned. Its walls decayed and the structure was buried by drifting soil. And that was the story until American scientists re-discovered it in what was now called the state of Kansas. Interesting, Chas. I was only very vaguely aware these bits of history. I'm currently in the middle of Empire of the Summer Moon, all about the Comanches in Texas. The resulting cogitation sure did help on this year's endless drive across the Comancheria.